Nour·ish: (verb) – to provide with the food or other substances necessary for growth, health, and good condition. AWAKENING: NOURISH will showcase creative ways to nurture ourselves and our community through food, stories and artistic expression in the Upper Peninsula neighborhoods of Rosemount, Bridgeview, North Central, Eastside and East Central as well as business corridors on Meeting, Morrison and King Streets. 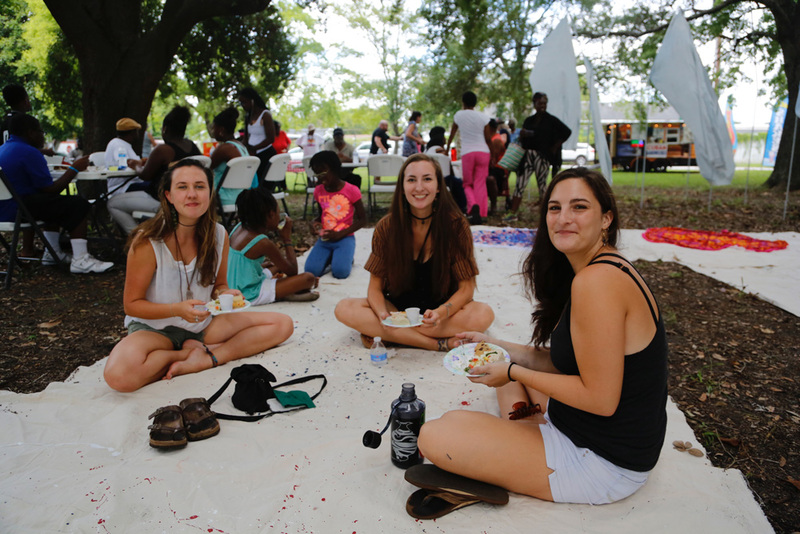 The purpose of AWAKENING: NOURISH is to connect and empower community based on creative and joyful access to nurturing food, stories, and art. THANKS FOR GETTING CREATIVE! EP’s CALL FOR COLLABORATORS is now closed. Still want to get involved? Email info@enoughpie.org to volunteer with the projects taking place this Spring. 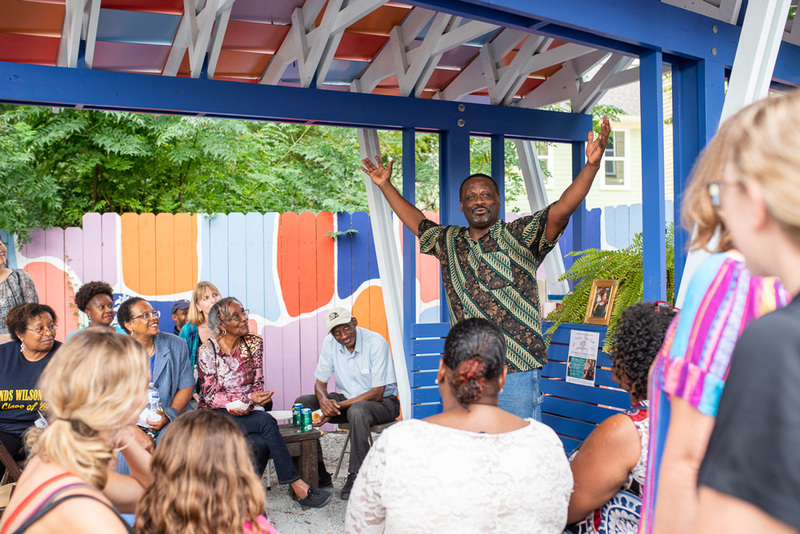 Weekly Soup & Storytelling (Ended December, 2018) served up vegetarian, locally-based soup from The Stone Soup Collective at the Butterfly Book Nook community garden (First African, 1020 King St. Over the course of 9 events, community members discovered new storytelling methods with local storytellers, and a community meal where conversation included attendees’ own stories and open discussions on how to craft stories. Some of the storytellers included Julian Gooding of John L. Dart Library, a specialist in West African tales and instruments, Becky Becker, a puppeteer, Zachary Hyde, a Medieval Literature specialist, and eight of the poets from the Free Verse Poetry Festival. Alchemy of Hands: Bread Baking Ceremony – “The fire of this community will bake this bread.” – Vanessa Mendes, Brazilian ceremonial bread baker On Saturday, February 9th at the Romney Urban Garden, Vanessa Mendes led a group of community members in a traditional baking ceremony. Participants got hands-on with the sacred art of baking bread, enjoyed nourishing soup, and experienced community around the table while sharing stories and recipes. Thank you to Historic Charleston Foundation and New Israel Reformed Episcopal Church. Cobb oven built by Root Down Designs. Check out the photos HERE. “And whoever enters is safe” reads the top of the Central Mosque website and “All Are Welcome” is the mantra of Enough Pie. Taste the important cultural diversity in Charleston via a vital cultural hub, the Central Mosque of Charleston. The Central Mosque of Charleston has members from over 35 countries who will share their family’s favorite dish with us to celebrate the unifying force of flavor. 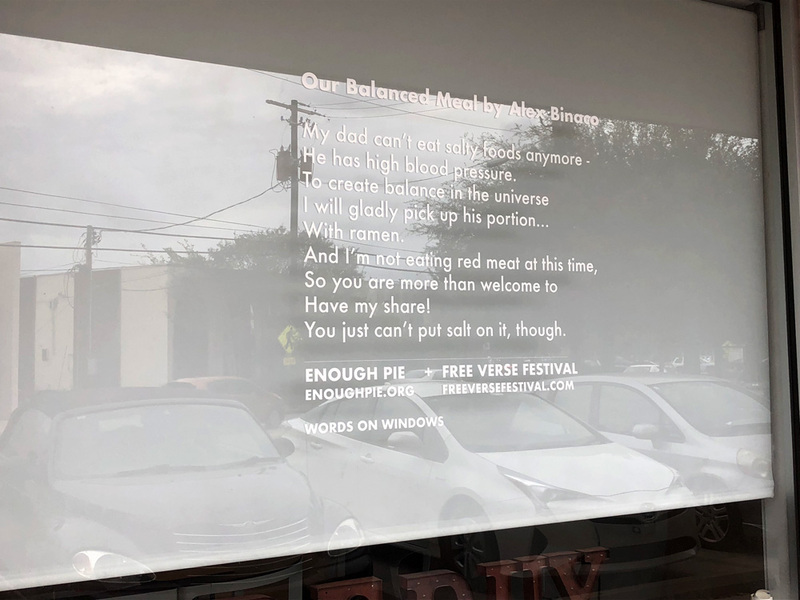 WORDS ON WINDOWS (October, 2018) – a collaboration with Charleston’s Free Verse Poetry Festival featured poetry from local poets with nourishment as their theme showcasing on windows of local restaurants including Santi’s, The Harbinger, Great Wall Hibachi, Haegur Plant Shop, REDUX Contemporary Art Center, Sugar Bakery, and Mercantile & Mash. Poets & artists included Vera Gomez, Susan Gregory, Rachel Stubbs, Beth Martin, Alex Binaco, April Bandy-Taylor, Marjory Wentworth, and Asiah Mae. Installations included different languages representing the residents of the Upper Peninsula, Arabic, Spanish, Spanglish, Mandarin, & English. THE FUNGUS AMONG US: Our Mycelium Connection (March 13 – 23 2019) Led by DC-based artist Naoko Wowsugi, the community will create a mushroom-themed meditational planetarium and community mapping project at REDUX Contemporary Art Center for AWAKENING: NOURISH. Artists Mikki Blackmon & Deborah Donovan Rice will fabricate the planetarium ceiling with their incredible textiles and help from EP’s knitting circle, while Ms. Wowsugi will create a video installation to project bringing to life the incredible secret superpowers of fungi. Collaborations with school students from James Simmons Elementary and Meeting Street Academy to fabricate mushrooms, and partnership with local experts will inform the installation. Connections with “invisible” threads for communicating across the space, and an unami-themed tasting will be part of this fun and festive installation. Programming throughout this 10 day show is being scheduled. If you want to collaborate, please let us know! Special thanks to Technical Event Company, The City of Charleston Department of Cultural Affairs, and The Post and Courier Foundation for support of this installation. 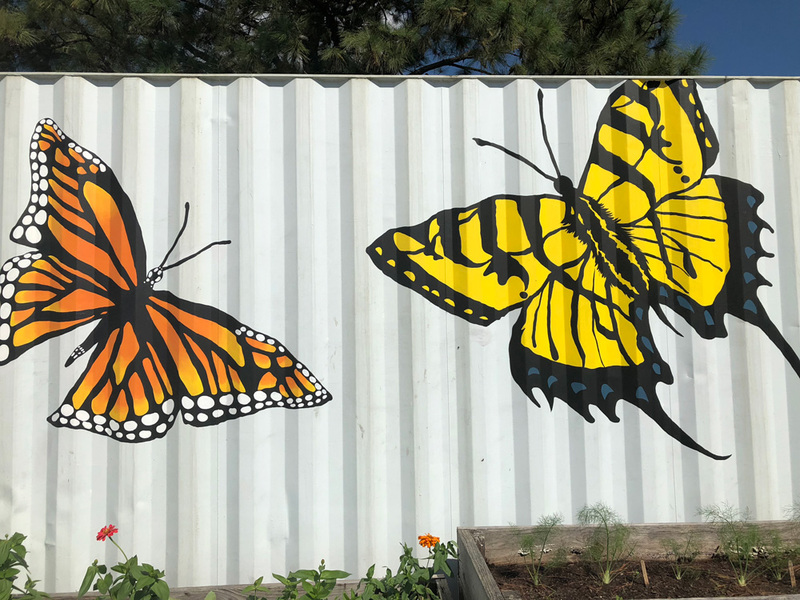 AND SO IT GROWS – public roadways to inspire the community through nutritious, colorful large scale artworks. The first mural collaboration, Delicioso! was painted on the wall of Santi’s in December, 2018 by Upper Peninsula Artist David Boatwright with support from painter Michael Kuffel. This project, AND SO IT GROWS, features 37 columns under the I-26 underpass with the shared theme NOURISH. In collaboration with chART and the City of Charleston and the SCDOT, we hope to realize this collaboration between artists & community members in Apirl, 2019. PUPPETS & PARKING LOTS (February 22-25, 2019)– a puppet collaboration with the Street Creatures (Asheville, NC) will come to Sanders-Clyde in partnership with the Charleston Promise Neighborhood and culminate in a giant dragon puppet created from plastic grocery bags. This puppet will be used to create unique moments of transformation, connection and magic, while highlighting alternative uses for plastic bags, recently banned by Charleston’s City Council. We will take the puppet out to play at Food Lion’s big spring gala in the parking lot, upon the renovation completion of the store. Date to be announced! 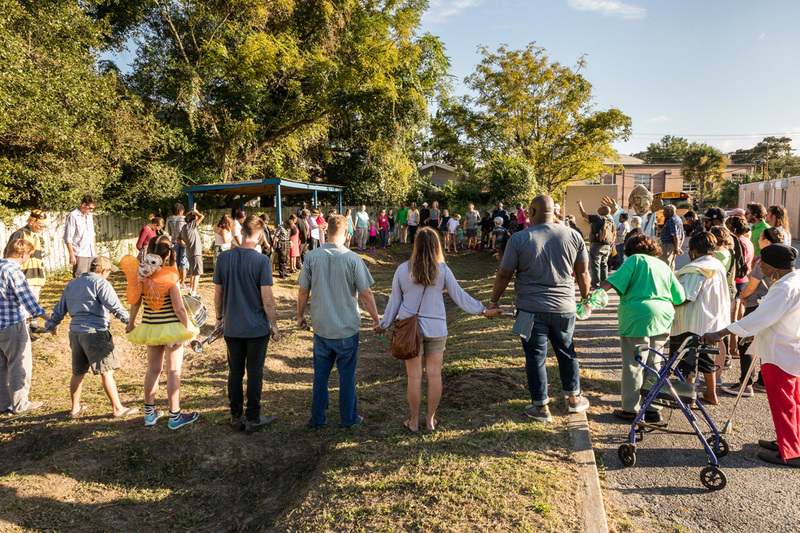 We are SO grateful for the support of our partners: The South Carolina Arts Commission, The Post and Courier Foundation, the Gaylord and Dorothy Donnelly Foundation, The Boeing Foundation, The City of Charleston, and so many individuals. AND: we need your help! Please support this project by donating online HERE . If you are a business that would like to support the project or an installation, please email Cathryn Davis at cathryn@enoughpie.org to receive information.